Serta iComfort Hybrid mattresses models combine our most advanced gel memory foam with their most advanced individually wrapped steel coil innerspring systems. These mattresses are an ideal solution for those who are interested in the benefits of gel memory foam, but prefer the support of an advanced innerspring. Every iComfort Hybrid mattress features our EverFeel ® Triple Effects ™ Gel Memory foam, an advanced material inspired by traditional memory foam, yet completely different. It is infused with millions of gel beads and to respond to your body’s individual needs for comfort, support and temperature regulation. 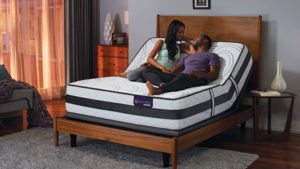 Select Serta iComfort Hybrid models feature our new SmartSupport ™ Memory Coil System, which is the world’s first memory coil support layer that brings the unique feel and response of memory foam to an advanced spring system. 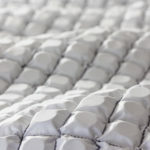 Hundreds of individually wrapped, slow recovery coils work with the foam layers above and below to continuously adapt to the contours of your body. Serta iComfort Hybrid mattresses are compatible with a Serta adjustable foundation, allowing you to elevate the head and foot of the mattress for optimal comfort when you are reading, checking emails watching television or just relaxing. Plus, select bases offer new luxury features including our breakthrough Serta ® SleepGPS ™ with SleepTracker Technology ™ in our most advanced model.